Department of Energy and Climate Change Blog» Blog Archive » Logging, casing, grouting… and the temperature’s rising! Logging, casing, grouting… and the temperature’s rising! Having won free of the Whin Sill and made brisk progress to 914m, the drill bit encountered very hard rock again and progress slowed to a crawl. At first, the drillers wondered if we’d hit a second leaf of the Whin Sill. Looking at my earlier predictions, this would have been a real surprise as, if we hit a second leaf at all, it shouldn’t be until about 1200m. When we’ve drilled into it in Weardale it hasn’t been particularly hard – so what explains the slow progress? Well, it’s possible that the recrystallisation process in the Newcastle area toughened it up more than usual. Also, in some places around Alston the Scar Limestone is rich in nodules of chert – essentially the same hard material as flint. Although we couldn’t swear to have seen any flakes of chert in the cuttings, if there were layers of flint nodules they would certainly slow the drilling. However, another explanation became apparent after we had persevered to 949m by 7.00 am on Tuesday 14th June. The gauges recording pressure on the bit began to give erratic readings, and it became apparent that all was not well at the cutting edge. While we’d originally planned to carry on another 50m or so before removing the tools from the borehole, the decision on when to pull back had been made for us. While the tools were being brought to surface, I spent a pleasant half hour with Paul Main – a former pitman who now works for the University at one of our halls of residence. It was great to compare notes with Paul about his own reminiscences of drilling through whinstone dykes down the pit. The pitmen dreaded that work, as it was so hard to drive roads through the whinstone. Here we are decades later facing the same challenge, albeit for a low-carbon purpose. We also compared notes on gas precautions – a major preoccupation for pitmen, just as it is with drillers – and on the way the pits and the drilling rigs have developed their own special language as well as a sense of camaraderie. When we got the drill bit back to surface late on Tuesday afternoon it was a sight to behold: not only were the teeth badly worn or absent, but the outer casing had been worn away altogether. 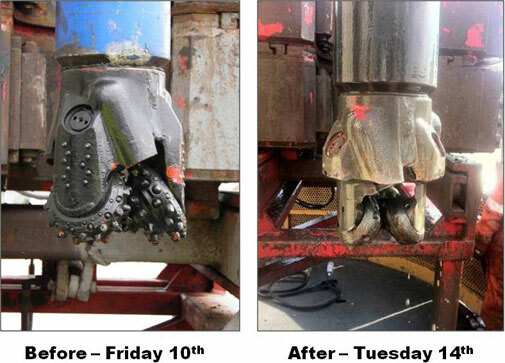 The ‘before’ and ‘after’ photos of the drill bit (below) are striking; the lads on the rig said they’d never seen a bit so badly damaged. It seems that the punishment the bit took in the Whin Sill left it vulnerable when it met further resistance from the Scar Limestone. 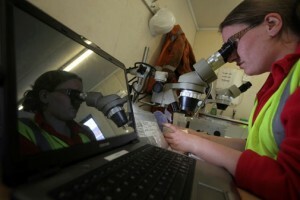 Once the tools were clear of the borehole, the team from the British Geological Survey moved in to investigate the borehole using special tools that are lowered down the borehole on a long cable. These tools, known as ‘geophysical sondes’ record all sorts of characteristics of the borehole walls and the fluid within them. 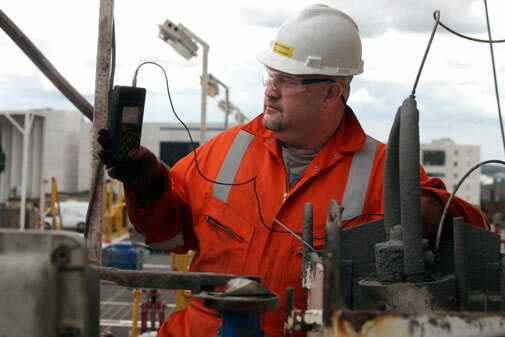 During drilling we had been able to measure the temperature of drilling fluid coming back to surface (see picture of Kevin Haughton, Geometric Drilling’s Senior Tool Pusher, with the measurement meter). This tells us what the mix of the entire open interval of the borehole yields to water being pumped past it at great velocity. It had reached about 28°C on Monday. However, with the downhole geophysical logging tools we are able to get a far more accurate picture of temperatures underground, and there was good news in store for us: at 949m the temperature was 40°C. Given that the shallowest temperature was about 10°C, this gives us an increase in temperature with depth of more than 3ºC every hundred metres – which is about 50% above the UK average (which is around 2.2). If the gradient remains at this value, then we can expect a bottom-hole temperature of 73.2°C at 2000m, which would be a great result for sure. Keep your fingers crossed for us. After the BGS team had worked a long night shift and most of Wednesday, it was time to start preparing the borehole for casing, i.e. installing steel tubing from top to bottom to make sure the borehole cannot cave in. 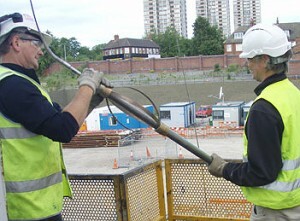 The Geometric Drilling crew did a great job and had the 949m metres of casing in the borehole by early evening. Overnight, a specialist team from Halliburton Well Services worked with the drilling crew to inject cement, which was forced to rise behind the steel casing to permanently grout the space between the steel casing and the borehole wall. After leaving the cement to set for most of today, the borehole is now ready for the final phase of drilling – onwards, down to 2,000m, or until the money runs out – I sincerely hope it is the former! Comments:	2 Comments on Logging, casing, grouting… and the temperature’s rising! 1. What sort of average “power” do you expect to get out of this geothermal project when in full operation – and for how long? 2. What is DECC’s definition of renewable in this context? 1. We won’t know for sure how much energy we can extract until further testing of the borehole, after it’s had a chance to settle down. The first phase of this will be geophysical logging in the early autumn, and depending on the results of that, probably test-pumping (once we have secured the extra funding needed to do this). We are pretty confident thought, that the very least we’d get, just by using this one borehole on its own, would be several hundred kW of thermal energy, but if the testing proves it’s worth drilling another borehole (to use as part of a pair performing abstraction and reinjection), we could be looking at anything from 2 to 25 MW thermal. 2. I can’t presume to speak for DECC, but here’s my view on the “renewability” of deep geothermal: There has historically been some debate over whether deep geothermal energy really qualifies as “renewable”. Some of the arguments against it are spurious e.g. “the planet will eventually run out of heat”. Well, the same is true of the Sun, which drives most other renewables (tidal is driven by the gravitational pull of the Moon, of course) – but exhaustion of the Earth’s internal heat supply will occur on a similar timescale to that of the Sun – i.e. billions of years hence. There will not be anyone (human or not) around to worry about it at that point. Of more pertinence is the point that, as any one borehole draws heat to it from a large volume of the Earth’s crust, it can locally exhaust the “patience” of the rate of heat production. This effect is inevitable, even in high temperature fields – though typically the rate of heat production takes about 40 years to decline to uneconomic levels in any one well. (Much depends on the design and operation of spent brine reinjection, which we need to do, both to maintain reservoir pressures and to avoid disposing brines to the surface environment, even though this can hasten the decline of thermal production). However, in mature geothermal fields all over the world, this problem is handled readily by drilling “make-up” (i.e. replacement) wells, anything from a few hundred metres to a few kilometres away along the same geological feature. The old wells are then simply rested until the heat builds up around them again, which happens exponentially, so you don’t need to wait 40 years until you use them again. When we model the long-term economics of large-scale geothermal production wellfields (I’ve done this, for instance, for volcanic fields in the Caribbean) we always include make-up wells in the calculations – and we’d do the same here.